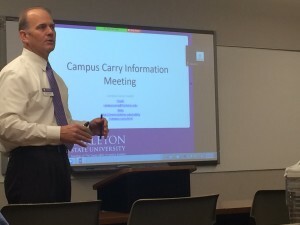 With the Dec. 1 deadline for a recommendation of rules from Tarleton’s Campus Carry Council (CCC) fast approaching, CCC Chair and Director of Risk Management and Compliance Kent Styron met with the Faculty Senate to give updates and receive feedback. The CCC was formed earlier this semester in response to Senate Bill 11 being passed in June 2015. This law, often called the “campus carry” law, allows Concealed Handgun License (CHL) holders to carry their weapons on university campuses. Styron opened discussion at the Nov. 9 meeting with background on CCC’s objectives and requirements of the law, which goes into affect on Aug. 1, 2016. The “campus carry” law allows each university to establish regulations regarding CHLs on campus as long as it does not generally prohibit license holders from carrying their handguns. The charge of the CCC is to create a set of rules and regulations to recommend for Tarleton, while making sure it follows law, Styron said. Not properly abiding by the law could cause Tarleton to be fined. “The law is written in a way that we are to put minimal restriction,” Faculty Senate President Don Beach said. After the CCC creates recommendations, they will pass to Tarleton administration for review. Tarleton may amend these recommendations before sending them to Texas A&M University System (TAMUS) Office of the General Counsel for a legal sufficiency review on Feb. 1. The rules will then pass to the TAMUS Board of Regents for final review before implementation. Styron presented to the Faculty Senate on behalf of the Campus Carry Council to about 25 faculty members. Any recommendations the CCC poses on Dec. 1 can be changed at each of these steps, so the CCC recommendation is likely to be different from the final regulations, Styron said. Styron presented data about Tarleton student population and CHL holders. He said about 1.42 percent of people age 21-30 get CHLs, which is 175-180 students at Tarleton. Styron did not give data on persons above age 30, which was about 27 percent of the student population over 21 in spring 2015, according to Texan Facts. An average of 2.06 percent of people age 31-57 got their CHLs in 2014 in Texas, according to Texas Department of Public Safety. The presentation showed that .1 percent of CHL holders had licenses revoked in 2014. According to the Texas Department of Public Safety, in 2014 in Texas about 2.5 percent of people age 21-57 had their licenses revoked. Styron also presented data that showed 99.97 percent of criminal convictions in 2013 were non-CHL holders. That data can be found here. Styron also discussed locations or programs that may be restricted based on potential harm such as sporting or interscholastic events, the on-campus day care, high-level research facilities and the health and counseling center. They also want to limit the number of “Transition Areas” where a CHL holder would have to disarm before entering. After the presentation, the floor was opened up for questions from faculty. One of the main questions was on training for faculty for active shooter situations. Styron said that his goal is to have active shooter situation plans for every building on campus in the coming months. Faculty members also asked if they could ban CHL holders from having guns in their offices. Styron was unsure if this would be allowed under the law. 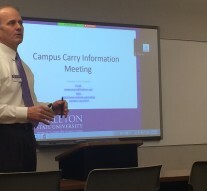 As the discussion faculty were asked to email in questions or concerns via campuscarry@tarleton.edu. Additional information about the CCC can be found here.